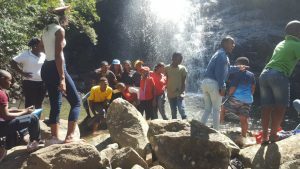 The Anglican Youth of Southern Africa in the Diocese of Mzimvubu went Hiking at Lugelweni falls Mt Ayliff on the 16 March 2019. The aim of this event was to encourage young people of the Anglican church to first enjoy nature by engaging with it in order to safe guard the integrity of Gods’ creation as per The Anglican communion’s 5th mark of mission and the call by Green Anglican Environmental network. As young Green Anglicans we seek to do all we can to safeguard God creation we focused on the fight against river, ocean, plastic and air pollution, thus encouraging youth to stop buying single use plastics as they end up in our rivers and oceans *destroying marine life. We also challenged each one present to commit to wise use of clean water as the country is facing huge shortages due to draught. Our day started by walking up the mountain, then later had our Eucharist service at the top of the mountain officiated by the diocesan AYSA chaplain Revd. Motsa together with Revd. Nogidela and Revd. Mpayipeli who also lead us in prayer as we were climbing the mountain. Young people had fun, playing games and photo shooting at the waterfalls. This was a great adventure and wonderful experience of enjoying Gods creation as young people. We would like to thank Tradition leadership of Lugelweni Mama Fikeni for allowing us to host the Event at The Lugelweni falls.